What seems like an ugly mess of paint soon takes the shape of a gorgeous alien sky and city skyline when these street artist in New York rapidly paints posters for passer by’s. The result is so amazing, it is hard to believe it was made by simple objects such as spray paint, lids, newspaper, a couple of paint scrapers and flicking paints with fingertips. And in just under 6 minutes to boot! While these guys are clearly experienced professionals, their techniques are still so simple that anyone could start using them right away. Wow! 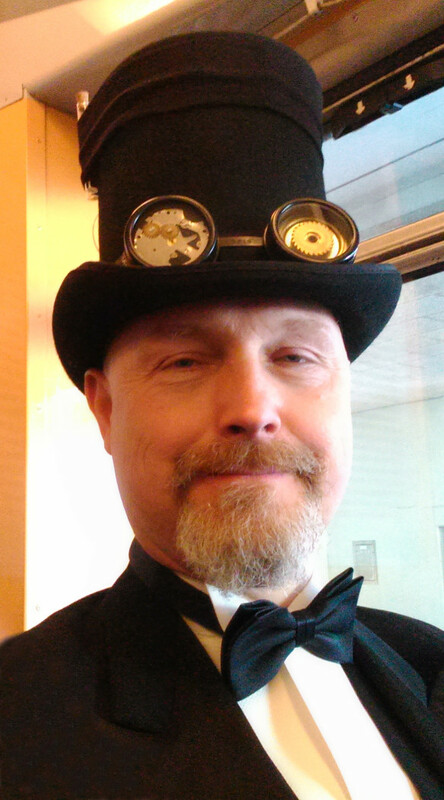 Today, as i was on my way home from a local mall, i noticed a very well dressed gentleman on the tram with a top hat and a pair of beautiful steampunk goggles. “Nice!” i remarked as i passed him by, and he nodded as to say “Thanks!”. Then, due to a failure of the tram, we got a chance to chit-chat, and i asked him about the goggles. It turned out that he had not just made them himself, he was also a member in a local steampunk society in my town! So i just had to ask him for a photo so i could show it to you all. His name is Peter Markusson, and he explained that the goggles were very easy to make, using nothing but a gear and the innards of an old watch. Sometimes the simple solutions are truly the best ones! If you want to ask him more about steampunk crafts, why not contact him on his Facebook page. “Nurnies” are thin layers of latex rubber, rubbed to produce stringy flexible structures. These are very handy in zombie special effects and can be used for skin damage, ripping flesh, gore and much more. In this video HELLRAISER’s makeup effects creator, Gary J. Tunnicliffe from Stan Winston School shows us how easy it is to make and apply them. While not focused on how to build devices, these videos show how calculations and logic circuits can be made from purely mechanical parts. In this demonstration, Matt Parker from standupmaths and Numberphile, uses dominoes, but this technique could easily be transferred to levers, cogs and many other mechanical pieces. While electronics does make for a much faster, smaller and easier calculator/computer, we still find this mechanical way of making a processing unit very fascinating and it might fascinate you too, if you are as much a fan of mechanics as we are.